Coming to the specifications, the Oppo RX17 Pro runs on ColorOS 5.2 based on Android 8.1 Oreo, and supports dual-SIM (Nano) slots. The smartphone features a 6.4-inch full HD+ (1080x2340 pixels) display with 19:9 aspect ratio and Corning Gorilla Glass 6 protection. It is powered by the Snapdragon 710 octa-core (two 2.2GHz Kryo 360 and six 1.7GHz Kryo 360 CPUs) paired with Adreno 616 GPU and 6GB RAM. Internal storage is at 128GB. Optics on the Oppo RX17 Pro include a triple camera setup at the back - one 12-megapixel rear camera with an f/1.5-2.4 variable aperture and OIS, a 20-megapixel secondary rear camera with an f/1.6 aperture, and a third Time of Flight (TOF) 3D sensing camera that essentially takes in depth information for 3D-effect photos. There's an LED flash accompanying this setup. At the front, the smartphone comes with a 25-megapixel front-facing Sony IMX576 sensor with an f/2.0 aperture and AI features. The Oppo RX17 Pro comes with a 3,700mAh battery with SuperVOOC Flash Charge support that claims to charge a device from zero to 40 percent in just 10 minutes. Connectivity options include a Dual 4G VoLTE, Bluetooth v5, Wi-Fi 802.11 ac, GPS, USB OTG, USB Type-C, NFC, and more. The dimensions of the smartphone are 157.6x74.6x7.9mm, and it comes with in-display fingerprint scanning support. In comparison, the dual-SIM (Nano) Oppo RX17 Neo is powered by the Snapdragon 660 octa-core (four 2.2GHzKyro 260 and four 1.8GHz Kyro 260 CPUs) processor paired with Adreno 512 GPI and 4GB of RAM. The horizontally stacked dual camera setup comes with one 16-megapixel rear camera with an f/1.75 aperture and another 2-megapixel secondary rear camera with an f/2.4 aperture. The setup is accompanied by a LED flash. 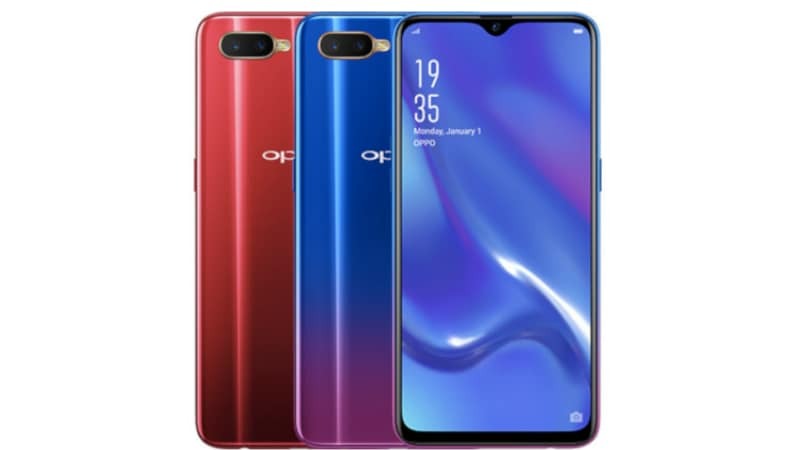 The Oppo RX17 neo packs a 3,600mAh battery, and connectivity options include Dual 4G VoLTE, Wi-Fi 802.11ac, Bluetooth v5, GPS, Micro USB port, and more. The dimensions of the device are 158.3x75.5x7.4mm, and it weighs 156 grams.